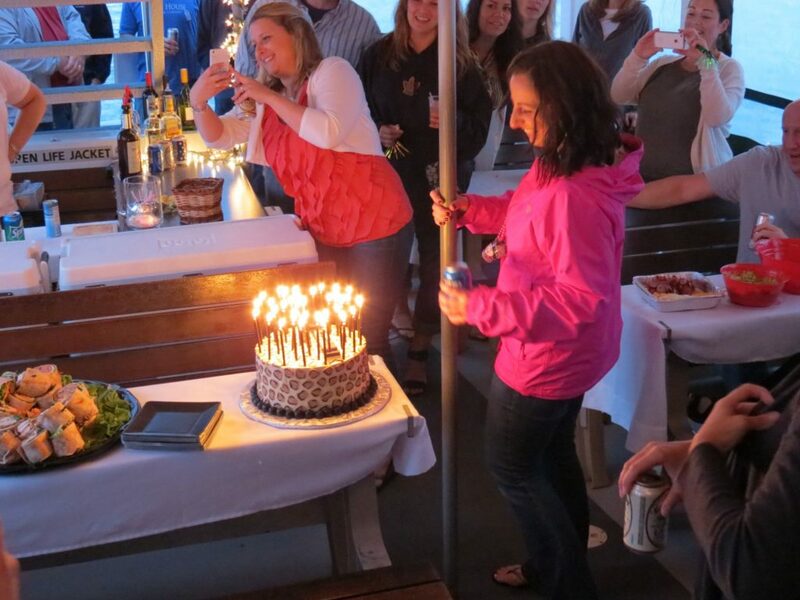 A great way to celebrate milestone birthdays, anniversaries, rehearsal nights, small intimate weddings, wine tastings, family reunions, corporate outings, or any other celebration or special event, to up 6o 50 people. A full sound system on board includes an I-Pod station, Pandora and CDs, so that your favorite music can be heard throughout the vessel. Another option that can be arranged for groups of 25 people or less, is a traditional clambake onboard for a true New England experience. The hourly rate includes: boat set-up and clean up, table linens, chafing racks and sterno if needed, candles for each table, hanging paper lanterns, music, bartender and self-serve coffee. A cash bar will be available for the purchase of alcoholic and non-alcoholic beverages. No one is allowed to bring on their own alcoholic beverages on board due to Massachusetts State Law and Licensing Regulations. $490.00 per hour (2 hour minimum is required). If you would like a longer cruise, more time can be added by the half- hour, with up to a maximum of 3 hours. Our crew will help you plan a fun and memorable event. Please call us today for more information to book your charter at 508-746-5342.